There's always $15,000 and $25,000 Weekly Guaranteed Tournaments at Intertops Poker on Sundays, but this week weekend they've added several special St. Patricks Freerolls and GTD poker tournaments. 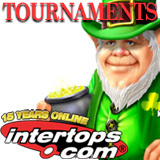 Players with the luck of the Irish can play for their share of the extra $1500 offered this weekend by checking the Tournaments tab at http://poker.intertops.eu. All St. Patrick’s poker tournaments start at 9:00 pm EST. Intertops has offered online poker nearly ten years now. It’s on the Cake Poker Network ensuring that there are always lot of other players at every level online. Texas Hold’em and Omaha ring games and tournaments of all stakes and levels run 24/7. For more than 15 years Intertops has taken pride in its friendly customer service and hassle-free deposits and withdrawals. One of the very first online poker, casino and sportsbook sites on the internet, Intertops is trusted by players around the world.